"Political trials take issues of responsibility, conscience, representation, and legitimacy, which are tied in tight political and legal knots, and force us to face questions about our public identity, our standards for public policy, and our sense of history. Ron Christenson explores how political trials, especially those within the rule of law, engage society's conflicting values and loyalties. He examines numerous political trials throughout history, bringing into question basic foundations of law, politics, and society. 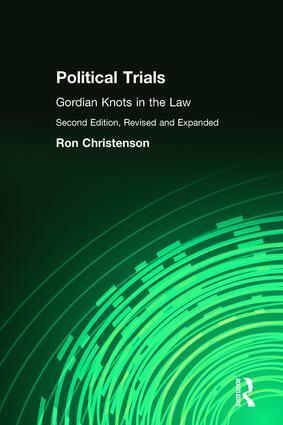 Christenson classifies political trials according to the issues they generate in the political sphere: partisan trials are spurious legal proceedings but politically expedient; trials of corruption and insanity raise questions of public and personal responsibility; trials of dissenters involve problems of conscience; trials of nationalists highlight the nature of representation and the relationship of the part to the whole; and trials of regimes engage the most fundamental concept of both law and politics--legitimacy. Political Trials brings these considerations to bear on some of the best-known cases in history, including the Gunpowder Plot; the Spanish Inquisition; the Dreyfus affair; the Nuremburg trials; trials of dissenters such as Socrates, Thomas More, Roger Williams, and the Berrigan brothers; and trials of nationalists such as Joan of Arc, Gandhi, Knut Hamsun, and the Irish republicans. Since the first edition appeared, a number of notable political trials have raised critical issues for society. Shocking public exposures about the Guildford 4 and Maguire 7 trials shook the British criminal justice establishment, while in the United States trials concerning the beating of Rodney King led up to the O.J. Simpson spectacle and a host of parallel questions. The trials of right-wing terrorists such as Paul Hill, found guilty of murdering an abortion doctor, and Timothy McVeigh, convicted of the Oklahoma City federal building bombing, parallel "
What is a Political Trial? Conclusion: Do Hard Cases Make Bad Law?